The Virage VIC or Vehicle Information Centre is for us and most other owners a continuing source of problems, and a totally opaque piece of technology. Our VIC has completely stopped working and G has had to substitute a replacement speedo/odo to keep it legal. Occasionally the VIC comes on, but the data is usually inaccurate or scrambled. Early symptoms of a problem are wildly inaccurate odometer readings – again a real problem for insurance or MOTs. The VIC cannot be removed and replaced with other gauges as the car will then not start – so even though it doesn’t function, it still seems to be on the route for control signals. Aston clearly realized the VIC was a poor design, as it was not used on later Virages (after about 1993 G thinks) or on the Volante. For those of us with early models it remains a problem. Some people have fixed the problem by replacing the fuse or cleaning the fuse contacts. Mattias reports success by re soldering the main connections. Neither of these worked in our case.Some owners have suggested that there is a backup lithium battery that may have failed. In our VIC there is no sign of such a battery. 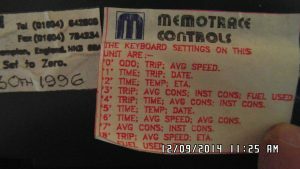 When G removed our VIC, he found evidence that the unit had been worked on in 1996 by Memotrace Controls who did some repairs. A transistor, capacitor and a resistor were added for some reason. The additions are attached to what looks like a rectifier, maybe to correct power surges that would likely affect the eprom storing the mileage data. 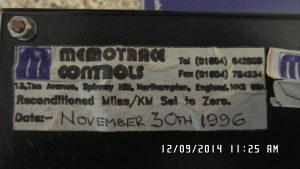 We chased up Memotrace, which seems to have been a one-man-band run by an electronics engineer called Ray Howard. Sadly Ray has passed away, and we cannot find any other source of expertise on the unit. The VIC in addition to being difficult to understand, is also pretty hard to access. For those who wish to investigate further, here is how you get to it, courtesy of G.
Firstly the entire leather dashboard top must be removed. To do this, take the carpet up and remove the side panels on either side of the transmission tunnel, which are held in place with 3 screws. Then unclip the heater hoses and slide the panels out. The dashboard top is held in place by two nuts (G thinks 8mm), on either side of the tunnel, which are not directly accessible by a normal spanner. Use a long extension and a torch to get to the nuts, and unscrew them. You can then remove the dashboard top, which is also held in place with clips. G did not replace the nuts after refitting the dash as it is quite firmly held in place with the clips and the studs to which the nuts attach. After removing the dash, the heater plenum chamber, and heater air pipes need to be removed, and you can then access and disconnect the VIC.